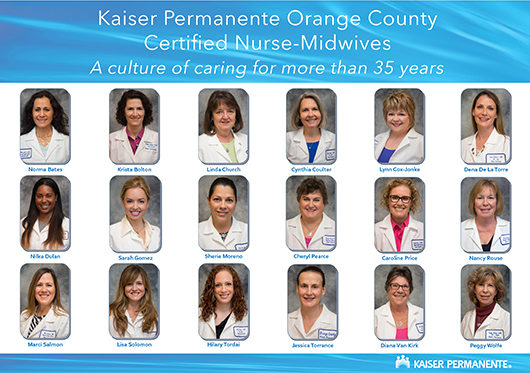 Kaiser Orange County is the proud home to one of the largest midwifery practices in the state of California with over 20 midwives actively practicing. Certified Nurse Midwives (CNMs) provider healthcare to women across the lifespan from adolescence through menopause and beyond. We particularly specialize in pregnancy, childbirth, and gynecologic and reproductive health. We complete annual well woman exams, birth control prescriptions, menopause treatments, treatment for vaginal infections and sexually transmitted diseases, and other female complications. We can also order any laboratory or diagnostic tests (i.e. pelvic ultrasounds, mammograms) that are deemed necessary. One hallmark of our practice is health education, including birth control counseling, healthy pregnancies, menopause counseling, and alternative treatments. We feel that each woman is a partner in the healthcare team and our goal is to help empower her and her family in her healthcare decisions and help make a plan of care that is suitable in each individual situation. We are mothers, sisters, aunts, and grandmothers just like you and have sat where you sit and gone through the joys and sorrows of life just like you. Since we are all nurses at heart, we bring to the bedside a caring and compassion nature that our patients love and appreciate. Copyright © 2005-2019 by Kaiser Permanente®. All Rights Reserved. Created by .